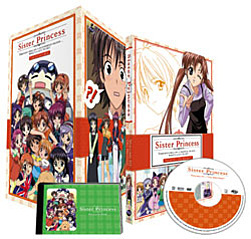 Contains Sister Princess DVD 1 plus a high-quality artbox to house the entire series and a special Sister Princess Postcard Book! Wataru Minakami was at the top of his class in middle school and had a pretty comfy life in Tokyo. When he unexpectedly fails his only high school entrance exam because of a computer glitch, his life is suddenly thrown into utter chaos! Jeeves, Wataru's trusted butler, sends him off to attend school at Stargazer's Hill in a mysterious place called Promised Island. Upon his arrival, Wataru encounters many friendly, cute girls. This isn't a problem – until he finds out they are all his sisters! For most kids, adjusting to life at a new school in a different town is tough enough. But for Wataru Minakami, high school will be the easy part! Twelve sisters all at once... What would YOU do? DVD Features: clean opening and closing animation, production sketches, a reversible cover, a letter from Karen, character bios, cast interviews with Serena Varghese (Hinako), Hilary Haag (Karen) and Braden Hunt (Wataru) and previews.